It might be cold outside, but be grateful you don’t live further North! If you are feeling chilled, Vinnie’s has just the thing… join us this week for seasonal favorites that will be sure to warm your soul. 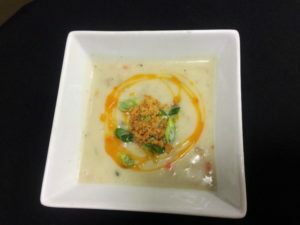 Delight in a hot, steamy bowl of Chef Tom’s twist on Clam Chowder, homemade NC Clam Chowder with Sunchokes, Scallions, Chorizo Oil and Toasted Cornbread Crumbles. From our friends at Locals Seafood, we have Grilled NC Snowy Grouper, served with Wild Mushroom Risotto, Ginger Beurre Blanc and Micro Greens. If you haven’t heard…Vinnie’s Steak House & Tavern’s website has a NEW look! Use the link below to check it out and let us know what you think. Take caution, photos may cause extreme desire for a night out at Vinnie’s. 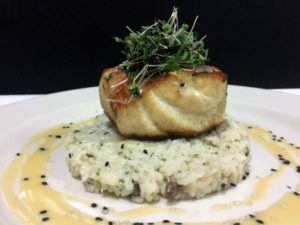 Grilled NC Snowy Grouper, named for the white spots similar to snowflakes on this delicious fish, will be served over a bed of Wild Mushroom Risotto, finished with a Ginger Beurre Blanc and fresh Micro Greens. If you’re looking for something warm and comforting, our homemade NC Clam Chowder features local Clams, Sunchokes, Chorizo Oil, Scallions and Toasted Cornbread Crumbles.